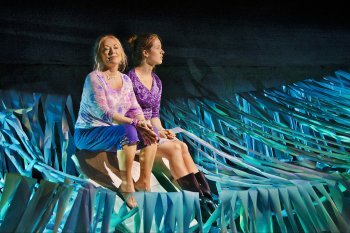 In the New York premiere of Renee Philippi’s play, The Bellagio Fountain Has Been Known to Make Me Cry, the quest to fulfill one’s hopes and dreams is highlighted in the relationship between a mother and daughter. Clashing personalities and a sense of reality define their relationship and lead them on a journey to find a middle ground. 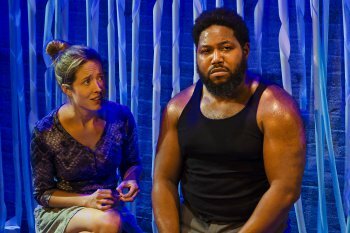 Also serving as Artistic Director of Concrete Temple Theatre and co-director, along with Eric Nightengale, Philippi uses the depth and mystery of water as a metaphor for what these characters are searching for in their lives and relationships. The intelligent and lovely Lisa Kitchens plays daughter Maria who always takes a serious and pragmatic approach to life, while mother Dixie (Melissa Hurst) encourages her to daydream. Dixie dreams of visiting the bright blue Bellagio Fountains in Las Vegas, beautifully described to be her by Curtis (Heinley Gaspard), a plumber who has become like part of the family, as he works on a pesky leak in their pool. Every member of this trio has experienced love and loss, and this show explores what it truly means to be human. Moments of drama exemplify the character’s toughest challenges, and their individual approaches to solving them. The strength of a woman as the leader of a household is brought to the surface, as these women have been let down by the men in their lives. The bond they share ultimately proves that true happiness can be found whether you achieve your personal goals and dreams or find something beautiful within yourself. The set design by Carlo Adinolfi uses a unique approach with cut-out rolls of paper representing a swimming pool and the waves of the ocean. What at first looked like an art-project gone haywire proved to be a delicate and intricate method to express the battles and hardships these characters experience and what they needed to do to keep afloat. This thought-provoking and emotional play is a wonderful reminder of life’s challenges and struggles and what it means for a family’s dynamic. A must-see. This enthralling sci-fi tale with shades of film noir is set in an apocalyptic NYC, and is performed solo by the puppeteer extraordinaire James Godwin. A short performance piece inspired by Longfellow’s epic poem. Overall it’s a lackluster though amiable avant-garde exercise that doesn’t make much impact.